Artist and art lecturer Buddy Ryan Kline (usually known as B. R. Kline) lived and painted in Ajijic in the 1980s. Kline was born on 22 August 1948 in Prince Edward, Virginia; his mother was a painter and his father a musician. Kline attended Falls Church High School and then George Mason High School (also in Falls Church) before studying art at Virginia Commonwealth University in Richmond, Virginia. His studies were interrupted in 1967 by the Vietnam War. During the war, Kline served with the U.S. Army Band at Fort Myer, Virginia, from 1967 to 1970. This is where he first met Dr. William St. John. The two men became inseparable companions and subsequently made a “good will tour” to some 91 countries. Kline painted his way around the world and ended up with 91 paintings, each representing a country he had visited. Kline first arrived at Lake Chapala in 1973 when he spent nine months in Mexico. He returned to Mexico in the winters of 1978-1980 and moved to Lake Chapala to live in 1983. Since leaving Lake Chapala in 1992, Kline has made his home in Dallas. Klien has held formal exhibitions in Virginia and Washington D.C. and has participated in numerous group shows in the Dallas-Fort Worth area of Texas. He lectured and held impromptu exhibitions in many different countries during his world travels. By the mid-1980s, Kline was working from his home-studio at Aquiles Serdan #3 in Ajijic and doing much of the commercial art for El Ojo del Lago (see image above). A pen and ink line drawing by Kline was chosen by June Summers for the cover of her short, self-published book about the area. 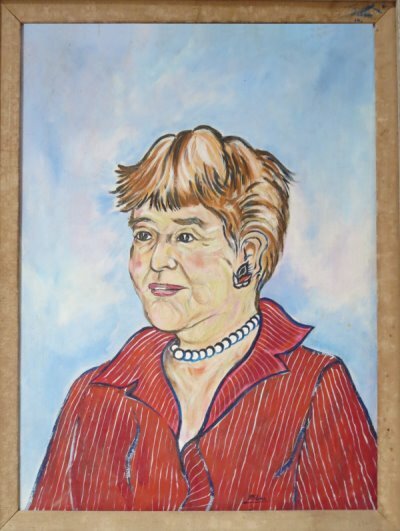 Kline painted this portrait of American author-traveler-benefactor Neill James for the Lake Chapala Society (which occupies her former home and gardens) in 1988. Kline was one of the large group of Lakeside painters whose work was included in a group exhibit in May 1985 at the Club Campestre La Hacienda (km 30, Guadalajara-Chapala highway). Other artists represented in that show included Daphne Aluta, Eugenia Bolduc, Jean Caragonne, Donald Demerest, Laura Goeglein, Hubert Harmon, Jo Kreig, Carla W. Manger, Emily Meeker, Sydney Moehlman, Tiu Pessa, De Nyse Turner Pinkerton, Eleanor Smart and Xavier Pérez. In 1990, Kline held a solo exhibition of his “newest and most vibrant art style” at the Studio Art Gallery in San Antonio Tlayacapan. 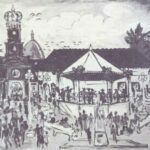 It was the last show to be held in the gallery, which had been run by Luisa Julian de Arechiga and her husband. During his time in Ajijic, Kline taught art and had a significant impact on the career of talented local Ajijic artist Efrén González, who also benefited from the artistic wisdom of Sid Schwartzman. Kline’s work varies greatly in style but is invariably both interesting and highly collectible. El Informador, 4 May 1985. 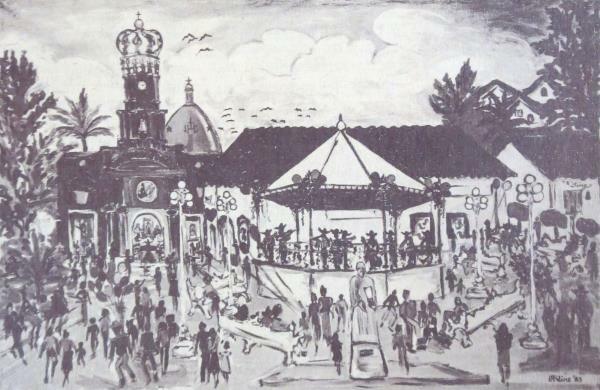 El Ojo del Lago, Jan 1985, May 1990. J. R. Compton. 2010. “Difficult Work“, Dallas Arts Review. This article has a wonderful range, including the two centerpieces: Sunday Night in PV and the lovely light sketched portrait of Neill James. Nice range of artistic activity too. Thanks for a great article and for great memories of the arts on the lake. Katie, Thanks for the kind words. It’s always great to know that someone is appreciative of my meager efforts to document the artists associated with Lake Chapala! Un abrazo, Tony.